Charming odes to traits like Grandma's center of warmth and Grandpa's inner curmudgeon. 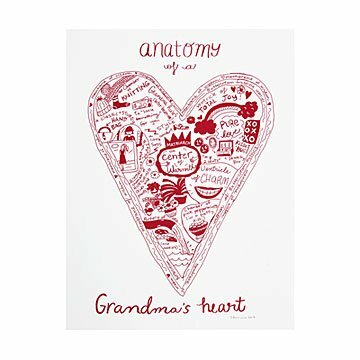 Celebrating the full picture of "grand" life, these screen prints feature Sandra Dumais' playful heart illustrations that offer refreshingly honest looks into nana- and pawpaw-ism. Inspired by her own experiences as a parent, Sandra hand sketches, paints, and digitally draws a narrative interplay of words and images. The result: odes to traits like Grandma's center of warmth and Grandpa's inner curmudgeon that make positively charming character studies. Handmade in Montreal. I will be giving a grandpa and grandma picture to my parents for Christmas. As new grandparents, I know they will love to hang them proudly in their cardiology office. My mother loved it. Didn't come framed. Maybe offer an option for a framed version.